Castiglione della Pescaia consists of some hundreds of houses with a few thousand inhabitants situated in a corner of the previously pestilential, coastal Maremma, between the sea and the hills, with rocks going down to the sea and beaches bordered by extensive pine woods. 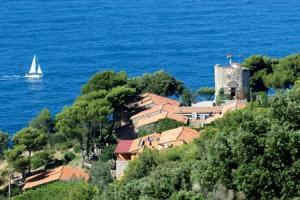 The fishing harbour is dominated by the mediaeval castle and the town is protected from the full force of the wind and sea by the island of Elba. Nearby there are the marshlands of Diaccia and Botrona, which are very important for their bird life. The first settlement at Castiglione della Pescaia probably stood on the hill facing the outlet of Lake Prile (Prilis Lacus) at the time when the Etruscans were building Vetulonia in the 9th century B.C. On the banks of the lake, near the outlet, the Romans established fisheries, salt basins and a village called Salebrone, which became a posting station on the Via Aurelia. It is from those fisheries, traces of which may still be seen today in the Paduline region, that Castiglione della Pescaia took its name. Another testimony of the presence of the Romans may be seen in the ruins of the Badia al Fango ("abbey in the mud"), standing on Clodia island in the middle of the lake. Click here for a fine range of hotels in the Maremma and other parts of Tuscany. On-line availability and booking by Italy's most reliable agency. In the year 962, desiring to grant further privileges, Otto I, Emperor of Germany ceded Castiglione della Pescaia to Pisa. The Pisans surrounded Castiglione with a ring of walls with eleven towers and three gates, as well as a building a triangular castle. Today, all this forms the upper part of the town. At the beginning of 1100, Saint William, 9th Duke of Aquitaine, came to the Empia valley or Malavalle of Castiglione. He had chosen this place, which was then unhealthy and little known, in order to serve God in rugged penitence and solitude. He died there on the 10th February 1157 to the sorrow of the whole Maremma, where today he is venerated as patron saint. In 1404, the inhabitants of Castiglione who, after the decline of the power of Pisa, no longer had protectors, decided in council to submit to Florence. Later, Castiglione passed into the hands of the Aragonese (1447-1460) and they granted the village to Antonio Piccolomini for 50 thousand gold florins. Exhausted by the war with Sienna, the Piccolominis ceded Castiglione to Eleonor of Toledo, wife of Cosimo I de' Medici, on 20th January 1559. Thus, after 110 years, the Medicis returned, no longer as protectors but as masters. Castiglione remained under Florence until April 1859, when the revolution drove out Leopold II, leading to his abdication and to Tuscany being annexed to the Kingdom of Italy. In 1833, Castiglione della Pescaia was declared an independent municipality. The town is now a seaside tourist attraction and during the spring and summer, the influx of tourists, both foreign and Italian, multiplies the population ten-fold. More about the beaches at Castiglione della Pescaia.